Anyone who has ever slipped in a bath tub can tell you how quickly and easily it can happen. A fall in the bath tub can lead to serious injury and even death f the bather lives alone and isn't found in a reasonable length of time. Bath mats can prevent these types of accidents and keep bathers safe. Most bath mats are manufactured from some type of rubber and have suction cups on the bottom to make the adhere to the bottom of slippery bath tubs. Most bath mats are the width of normal bath tubs and about 2 feet long while the pictured Drive Medical bath mat is the full length of the bath tub providing greater protection from slipping. 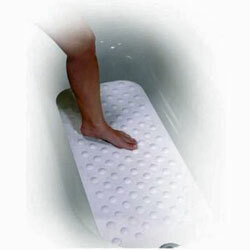 Bath mats are available from a variety of retailers and are an inexpensive accessory to prevent injury from falls. 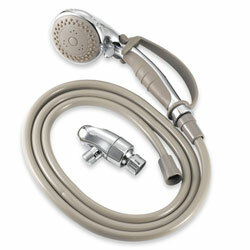 Hand held showers are the best way to bathe when using a bath seat, bath board or bath lift of any sort. Users who require the use of a bath seat or bench usually aren't able to reach the water controls in a bath tub let alone the shower head so a hand held shower is often the answer. If you choose a hand held shower that can be turned off at the shower head, you'll be able to put the shower down when lathering up and turn the water back on to rinse off without having to reach for the water taps. The easiest way to install a hand held shower is to remove the existing shower head and screw the hand held shower hose on in it's place. Hand held showers usually come with a mount that will allow the hand held shower to be mounted onto the existing shower head pipe and used as a regular shower. An alternate option for installation is to replace the tub spout with a diverter spout and hooking the hand held shower hose to the new spout. The diverter spout has a switch which diverts the water from the spout to the hand held shower when used. Hand held showers are available from a variety of retailers including department stores, hardware stores, plumbing stores, building supply stores and home health care stores. They can range in prices from less than $20.00 to over $150.00 depending on the features and quality of the unit purchased.